Two winners will receive a $10 Target gift card as the prize! Share your dog’s happy pic for a chance to win! Who will represent TEAM DOODLE? Who will represent TEAM DOG? 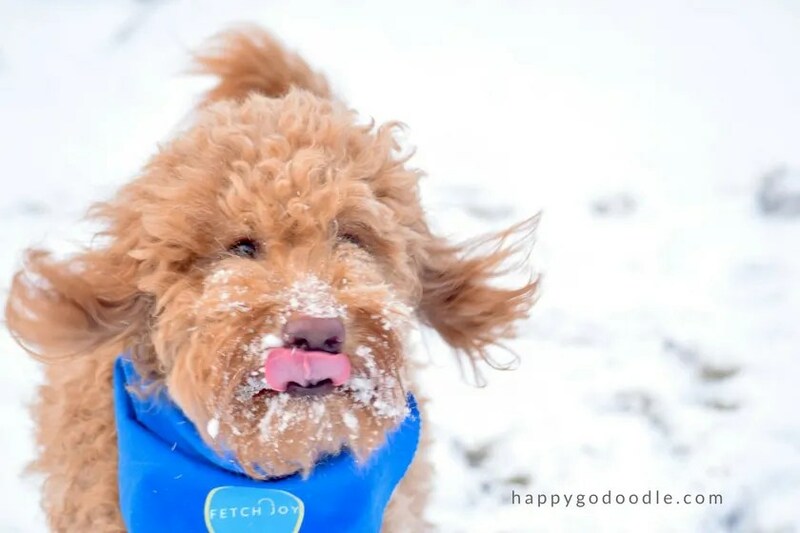 What amazing pups will have their photo chosen for Happy-Go-Doodle’s first-ever DOGS LOVE WINTER GAMES photo contest? We’d love to see your pup’s pic! Enter your dog’s photo for your chance to win! DOGS LOVE WINTER GAMES? What’s this all about? Inspired by the 2018 winter Olympics, where athletes amaze us with their skills, Happy-Go-Doodle’s DOGS LOVE WINTER GAMES photo contest is a chance for our dogs to amaze us with their smile-bringing feats! Does your dog chomp at the chance to sprint through the snow? Show us those skills? Does your dog have the grace of a figure skater doing a fur-flowing routine? We’d love to see it! 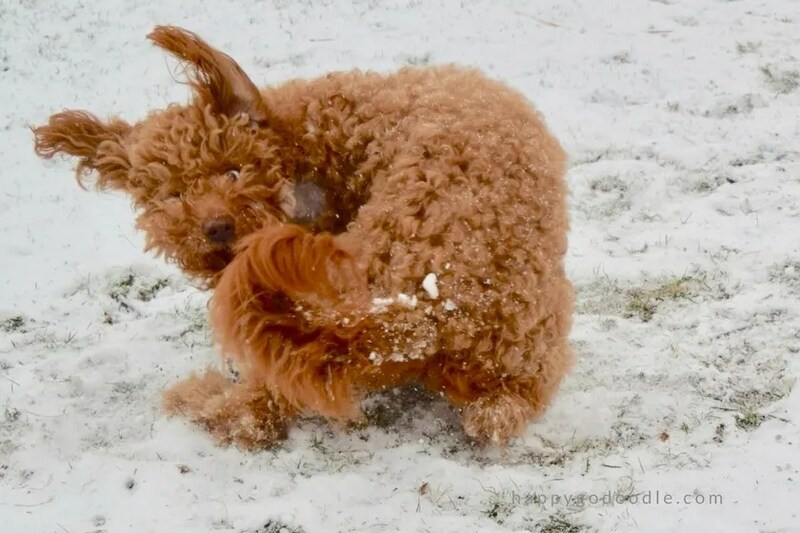 Happy-Go-Doodle’s DOGS LOVE WINTER GAMES photo contest is a fun way to celebrate amazing dogs of all shapes and sizes, to share our love for our smile-bringing canine companions, and to celebrate their silly antics together! Happy-Go-Doodle Chloe’s always sniffing out new adventures and looking for more ways to bring more smiles to your day. This photo contest is a new way for us (dog lovers, doods, and dogs) to have snow-tacular fun together! We hope you’ll paw-ticipate along with us in this photo contest! It’ll be a fun way for all of us to show our DOGS LOVE WINTER GAMES pride and team spirit! 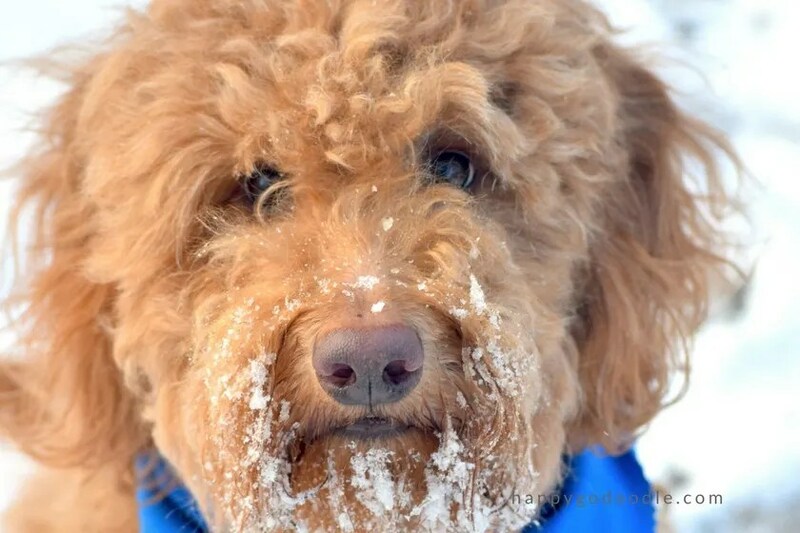 Happy-Go-Doodle Chloe’s ready to host her first-ever DOGS LOVE WINTER GAMES photo contest! Join in the fun with her! How many will win the photo contest? There will be two photo contest winners! One dog will win for TEAM DOG and one dood (any “-oodle” dog mix) will win for TEAM DOOD! These two dogs will be Happy-Go-Doodle’s DOGS LOVE WINTER GAMES photo contest winners. We like to imagine them standing at the top of the DOGGOlympic paw-dium. 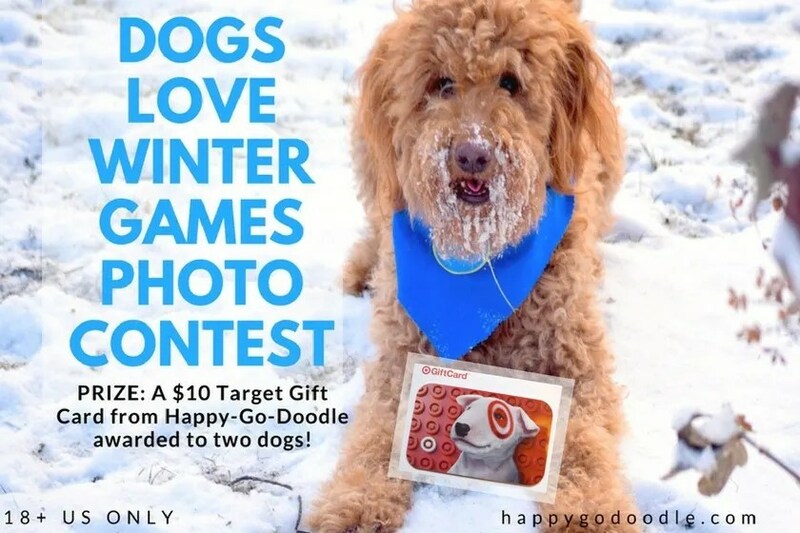 The two grand prize winners will each receive a $10 Target gift card and be featured in Happy-Go-Doodle’s DOGS LOVE WINTER GAMES photo contest blog post announcement! will have their dog’s pic included as part of the first DOGS LOVE WINTER GAMES photo contest blog post announcement. Approximately 10 dogs will be selected as TEAM DOG and 10 dogs will be selected as TEAM DOODLE. Depending on the number of entries, the judges reserve the right to add more members to each team! 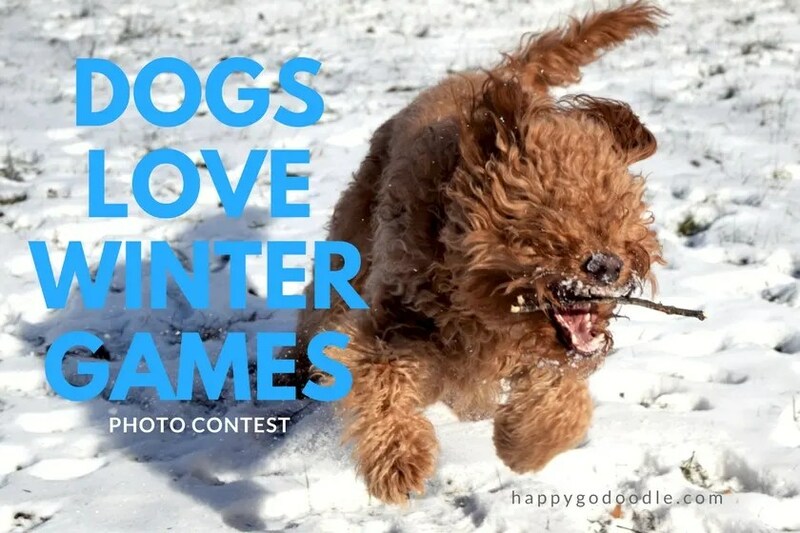 who enters and follows the contest rules will have their dog’s name included as part of Happy-Go-Doodle’s DOGS LOVE WINTER GAMES photo contest blog post. What are the dates of the photo contest? The contest begins now and ends at 11:59 pm CT on February 16, 2018. There’s no purchase necessary. Where may my photo appear? By entering, you agree that we can post your photo to Happy-Go-Doodle’s blog, social media accounts, and along with any news or promotion about the contest. By entering, you are giving us permission to use your photo both now and in the future. photo color, quality, family-friendliness* and clarity. What’s the subject matter of the photo? Your photo should feature a smile-bringing pic of YOUR dog(s) and relate to the DOGS LOVE WINTER GAMES theme. Does your dog have the grace of a figure skater? Show us that form! Does your dog bound through the snow with silly skills? Let’s see it! Maybe your pup catches air better than the best downhill skier! Snap a pic! While the theme is winter, your pup’s photo can be taken indoors or outdoors, warm climate or cold climate. Happy-Go-Doodle Chloe’s practicing her favorite Olympic sport: tail-chasing! Look at that form! Figure skating’s fun, but let’s make TONGUE TO YOUR NOSE the next Olympic sport! Who’s with me! The contest is open to US residents only, ages 18 and over. One submission per household. The photo must be yours. Family members of Happy-Go-Doodle are not eligible to win the prize. The two (2) prize winners and runners up will be announced on our blog, happygodoodle.com, the week of February 19, 2018. How will the winner be informed? TWO (2) grand prize winners will each receive a $10 Target gift card and be featured in a DOGS LOVE WINTER GAMES blog post. EVERYONE who enters and follows the contest rules will have his or her dog’s name included as part of the DOGS LOVE WINTER GAMES blog post. We’re all furry, family-friendliness here at Happy-Go-Doodle’s DOGS LOVE WINTER GAMES. If we were a movie we’d be G rated, so we reserve the right to disqualify any entries that aren’t rated G for good…or good-humored…or great fun. Also, this contest is not administered by or associated with any social media used throughout the contest. Who will be the rebarkable dogs of Happy-Go-Doodle’s DOGS LOVE WINTER GAMES? Follow along with Happy-Go-Doodle to find out! Curious to see the winners from our last photo contest? Check out our Dogs Love U photo contest blog post, These Dogs Love U | Dogs Love U Photo Contest Winners Announced. Thank you for joining us on our DOGS LOVE WINTER GAMES adventures…and thank you for loving dogs as much as they love us. If this story brought a smile, a laugh, or a WOOF, please comment below! Great! Happy you’ll be joining the winter photo fun! Good luck! How fun! I look forward to seeing all the entries! Thanks! It will be fun to share the follow-up post! Chloe looks so happy in the snow! I can’t wait to see all of the entries. I may need to consider how I could capture winter in the desert. We’ve been in the 70s for weeks now. Yes, she loves snow! It’s definitely zoomie-worthy! All types of winter photos are welcome – warm locations or cold! Look forward to seeing a desert winter day with the Doods! Thanks so much for stopping by! I look forward seeing your results. I loved the entires to our video challenge and felt everyone achieved something amazing and new for themselves! I suspect I will spend a lot of time giggling at your results! Dogs + Snow = FUN. Thank you! Yes, Chloe is 100% pure happiness! We have so much fun together on our adventures. We enjoyed the video challenge that you held on your blog. It’s fun to see everyone’s personality shine through in video. We’re so excited to see all the smile-bringing photos of doods and dogs coming in! Now I wish we had some snow so I could get a pic of my niece’s dog! What a cute contest. Thank you! Any winter pics of pups are welcome. Snow or no snow, it’s all about the fun! This is so much FUN!!! I am going to share so others can enjoy this contest! Dogs playing in the snow is just the best! Chloe is just so gorgeous and it’s so fun to see her out romping in the snow. You can tell she loves it! What a fantastic contest and cannot wait to see all the pictures. We will not be entering unfortunately as we do not have snow here, actually it is sunny and warm and we need the rain in San Francisco. What a fun contest! Both of my dogs loove the snow! It snowed here this morning too, but then turned to rain that melted all the snow away, unfortunately. The pups are much less impressed with the rain haha. I’ll have to look through my snow pictures from last year. There really wasn’t enough snow this year to make for good photos. Mr. N was a little disappointed. This sounds like a lot of fun but unfortunately since we are cats and we rarely have snow, we can’t enter. Can’t wait to see everyone’s photographs. Great idea! I think I have some photos of my springers. Unfortunately, neither of them are still around. My cocker, Buffy hates the snow, but my springers LOVED it. Sweet. I’ll have to share news of this contest with my dog lover peeps! Thank you so much! The more dog lovers who participate the more smile-bringing photos we’ll have to enjoy in the follow-up post!